Grand Forks photographer Dave Bruner and his wife, Sheila, recently returned from a trip to the Southwest, specifically Arizona. Among the sites they saw were a sunrise at Watson Lake, near Prescott. “The lake is surrounded by unique rock structures that make interesting compositions for photography.” Also a sunset at Lake Powell, near Page. Antelope Canyon-Page, Arizona One of the trip’s highlights was a photography tour of Antelope Canyon. In Dave’s words: “I had to book ahead with a Navajo guide and had two hours to photograph these wonderful images created by Mother Nature. The winds outside were around 40 mph, but inside the cavern the dust and sand blowing down from the top openings mixed with some of the light beams shining down to create some interesting effects. 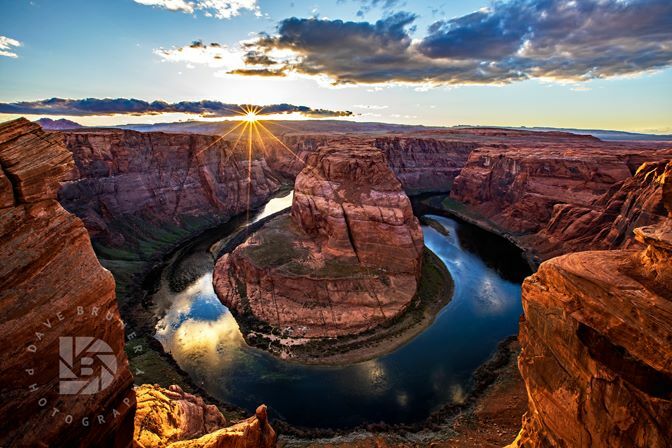 “Horseshoe Bend Sunset”: Iconic overlook south of Page, Ariz.